Isn’t it so fun to have some real comfy food? Use fresh herbs if you can as this is where the flavor is – as well as (extra) garlic and onions. Add butter and oil to a large skillet on medium heat. Sauté onions, carrots, celery, fennel and garlic, until just soft, about 10 minutes. Add the ground beef and cook until beef is cooked through, about 10 minutes. Add the tomatoes. Season with salt and pepper, to taste. Cook and simmer for another 10 minutes. Mix in peas – if using frozen, it is ok if they are still frozen here. Transfer mixture to an oven-proof baking dish and spread evenly over the bottom. Add the cooked mushrooms on top of the meat (then place potato on top of the mushroom layer and spread out evenly) Cook in a preheated oven until browned about 20 minutes. 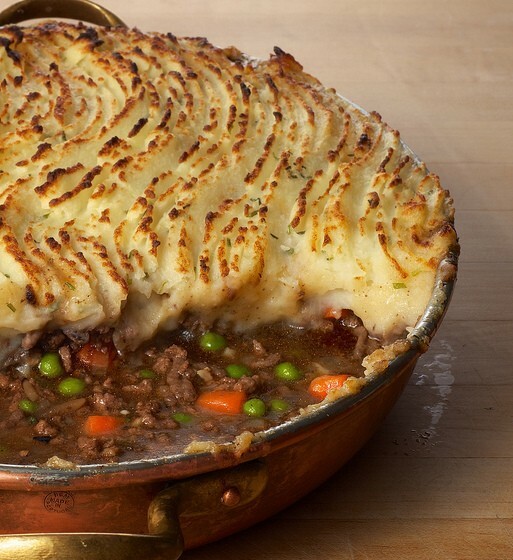 Spoon out the beef stew or shepherd’s pie and serve.